Washington (CNN) President Donald Trump was infuriated after it quickly leaked that he had been directly instructed by his national security advisers in briefing materials not to congratulate Russian President Vladimir Putin on his recent election victory during their call Tuesday morning, a source familiar with the President's thinking said. The leak comes as McMaster's standing the West Wing remains in question. After Trump fired Secretary of State Rex Tillerson on Twitter last week, speculation intensified that McMaster was next to be ousted. The White House denied last week that McMaster was on his way out. Venality, I take it, is not a venial offense. Donald like me may be ADHD & dyslexic. If so, mightn't he have misread DO NOT CONGRATULATE as DO CONGRATULATE? In any case, I am adding this event to my 30-item list of circumstantial evidence suggesting that Trump is a Manchurian candidate. In any event, somebody on the WH staff was so alarmed that he blew the whistle to the WAPO. The possibility that Mr. Putin could have some hold on the American president has lurked in the background over the past year as Mr. Trump displayed a mystifying affection for the Russian leader and ignored or excused his aggressive behavior and nefarious activities, most important, his interference in the 2016 campaign, a subject of the special counsel Robert Mueller’s investigation. Some Trump defenders noted that President Barack Obama also called Mr. Putin when he was elected president in 2012. But the circumstances are very different. In the intervening years, Mr. Putin has become an increasingly authoritarian leader who has crushed most of his political opposition and engineered a deeply lopsided re-election this week. American intelligence officials say they are certain that he meddled in the 2016 American election on behalf of Mr. Trump and is trying to meddle again in the 2018 election, as well as in many European elections. Russia annexed Crimea in 2014, is waging war in other parts of Ukraine and is enabling President Bashar al-Assad in Syria. While the administration recently imposed its first significant sanctions on Russia for election interference and other malicious cyberattacks and has faulted Russia for the poisoning of a former Russian spy and his daughter in Britain, Mr. Trump has refrained from criticizing Mr. Putin or calling him to account. The phone call reinforced that approach. What Mr. Trump didn’t say to Mr. Putin was as significant as what he did say. He did not demand that Mr. Putin stop meddling in American elections or others, he did not even raise Moscow’s role in the poisoning. He made no mention of the unfair political system that deprives Russians of a real say in their government. The White House press secretary, Sarah Huckabee Sanders, later reinforced Mr. Trump’s lack of interest, telling reporters it was not America’s place to question how other countries conduct their elections. The disparity between Mr. Trump and his advisers, who seem to take threats from Russia more seriously, is becoming more pronounced. A senior administration official told The Times that Mr. Trump didn’t want to antagonize Mr. Putin because fostering rapport is the only way to improve relations between the two countries. On Tuesday, the president said he hoped to meet Mr. Putin soon and discuss preventing an arms race — an arms race both leaders have encouraged with loose talk and investment in new weapons. While Mr. Trump panders to Mr. Putin, his criticism of Mr. Mueller, is becoming harsher, as the investigation raises increasingly serious concerns about a web of ties connecting Mr. Trump’s associates to Russia. Mr. Trump’s former national security adviser, Michael Flynn, has pleaded guilty to lying about his involvement with Russia. A former foreign policy adviser, George Papadopoulos, has pleaded guilty to lying about his involvement with Russians. A former deputy campaign chairman, Rick Gates, who had his own Russian connections along with a now-indicted former campaign chairman, Paul Manafort, has pleaded guilty to lying about Russian-related matters. Mr. Mueller has subpoenaed Mr. Trump’s company for any documents involving Russia. Democrats on the House Intelligence Committee say Mr. Trump was “actively negotiating a business deal in Moscow with a sanctioned Russian bank” during the 2016 campaign season. And Mr. Mueller has charged 13 Russians with conspiring to subvert the 2016 election and put Mr. Trump in the White House. 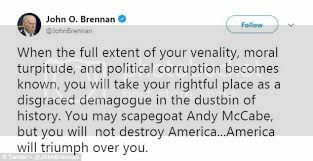 Mr. Brennan’s fears clearly arise from some of these elements. If Mr. Trump isn’t Mr. Putin’s lackey, it’s past time for him to prove it. How about a category that he's Putin's lackey! I still like him as a Manchurian candidate. But has anyone yet suggested unconscious homoeroticism? I don't think anyone has but the Times could be wrong about Trump being Putin's lackey--there's someone next to Putin in that photo-the horse is hiding his face from view-he could be Putin's lackey and he looks much smaller than Trump--otoh maybe Putin has more than one lackey. Paraphrasing Peter Gelb, the current poster-boy of the GOP is the 2-ton elephant in the Oval Office. the current poster-boy of the GOP is the 2-ton elephant in the Oval Office. what odds would I get in a Biden Trump street fight! A WWE Biden-Trump match to decide the 2020 election might be the only way we would have to evade Putin's active measures, which by that time should be in full control of our electoral apparatus. Since WWE matches are all rigged, this might be right in the Donald's wheelhouse.